Are you ready to be the wildest gal in the Wild West? You may have the right attitude but you need the right duds. If you’re going to walk the walk then you need to talk the talk, right? 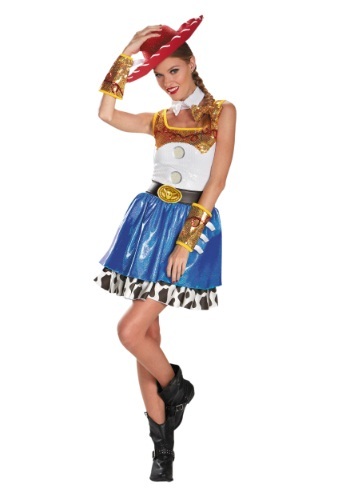 So check out this Jessie Glam Costume, it will be perfect for rounding up the best Halloween you’ve ever celebrated! The fun can finally begin when you enter the party scene in this western inspired dress. You’ll be ready to start the rowdiest hoedown anyone has ever seen. Hit the dance floor with a good ole fashion yodel and show all those city folks how a country girl gets down. Bust out your best moves in your favorite pair of cowgirl boots and pick out the perfect cowboy hat to top off this easy to assemble ensemble. Aside from the cute dress, this costume includes the satin white collar, the faux leather belt, and the sequin yellow gauntlets. All these adorable, quirky accessories really bring the whole costume to the next level of fun. You’ll be ready for any adventure that comes your way with this awesome outfit. Have your friends take a look through the rest of our western inspired costumes and all of you can show everybody how the Old West used to party! Of course, you can also have your date dress up as Woody or Buzz for a fun couples costume. Just keep an eye out for snakes, we hear they like to hide in unsuspecting cowpoke’s boots.